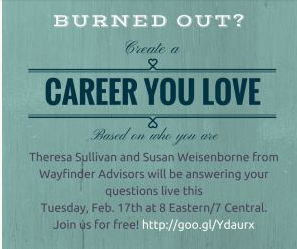 Meet Theresa Sullivan and Susan Weisenborne, career and life coaches as well as partners in Wayfinder Advisors. They are also Featured Business Owners at SCORE Chicago this week. Learn how they started and what tips they have for your success. We help people find the direction and courage to transition from careers and life situations they no longer want to ones they can positively thrive in. We do this for professionals in the US through both group virtual coaching and private coaching. Our clients are generally professionals in corporate settings who know they’d rather be doing something else, but not knowing what that is or how to transition. Some of the transitions we’ve seen our clients pursue include an unhappy attorney transition into a freelance writing career, a stay at home mother and recent divorcee start her own marketing firm, and a man paralyzed by his fear of not making the right decisions for himself get the courage to get married, become a father and move to his hometown while keeping the job he was sure he could only keep if he stayed in Chicago. People leave our programs with the confidence to pursue the things they truly want in their lives. New client growth. Career advising and coaching is an intensely personal subject. People don’t traditionally tell everyone on LinkedIn or Facebook that they are working with a coach, so referrals are usually passed along only in personal, trusted relationships. Then it takes many people time to build up the courage to even make the first contact about coaching, so it has taken more time than we bet on to build the business. Peg Corwin has been our SCORE mentor for a couple of years and I never leave a meeting with her that doesn’t give me a new idea to make my business better. She is a consummate professional and social media guru, and I rely heavily on her for making our ideas a reality in the market, and she is always sending me information relevant to running a business like ours, which always seems to arrive in my inbox just in time! Find mentors you respect and trust and be open to everything they have to teach you. My mentors’ wisdom has been invaluable when I’m stuck on an issue or need some advice or encouragement. I can always move forward with a fresh perspective and inspiration after asking for help from one of them.